Gaon of Sura (765-775); contemporary of Malka b. Aḥa, principal of the academy at Pumbedita. 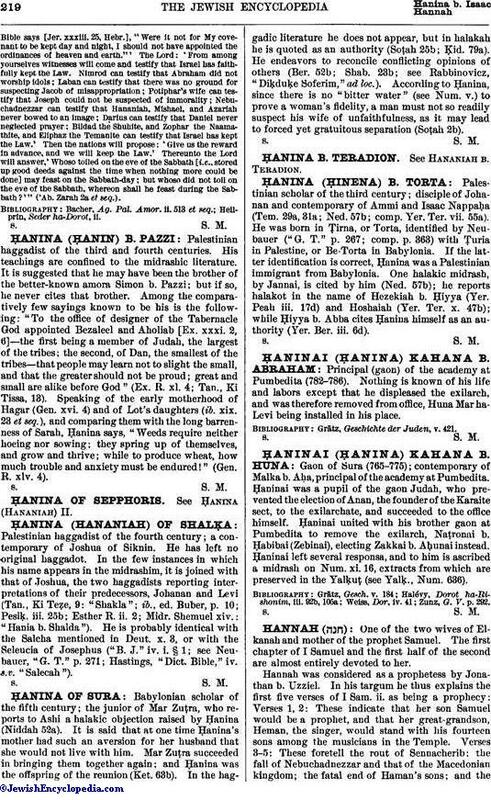 Ḥaninai was a pupil of the gaon Judah, who prevented the election of Anan, the founder of the Karaite sect, to the exilarchate, and succeeded to the office himself. Ḥaninai united with his brother gaon at Pumbedita to remove the exilarch, Naṭronai b. Ḥabibai (Zebinai), electing Zakkai b. Aḥunai instead. Ḥaninai left several responsa, and to him is ascribed a midrash on Num. xi. 16, extracts from which are preserved in the Yalḳuṭ (see Yalḳ., Num. 636). Zunz, G. V. p. 292.